The heiress to the Getty Oil fortune Natalia Williams, commonly known as Nats Getty, is a fashion designer by profession but is best known for her romantic involvement with American YouTuber, actress, and model Gigi Gorgeous. Nats is a lesbian while her beau Gigi is a transgender lesbian woman. Moreover, recently in 2018, the pair got engaged to each other in the grandest way possible. Born on 30th November 1992, 25-year-old Nats is best known for her stud style and owns a clothing line called Strike Oil. She is also known to design custom leather jackets for the line. Here, we are going to share some information about the billionaire's relationship with YouTube star Gigi Gorgeous and his grand proposal. Nats Getty's relationship with YouTube star Gigi Gorgeous. Nats and Gigi first started dating back in 2015. Even though Nats is a famous personality for being a part of one of the most powerful families in the United States, she mostly gained fame through Gigi. It was in the year, Gigi uploaded a video of herself coming out as a lesbian and shared that she fell in love with Nats who is very special to her. After the announcement, Nats appeared more on YouTube and other social media of Gigi making them one of the most popular gay couples on the internet alongside Shane Dawson, Ryland Adams, and others. However, just a year into their relationship, Gigi uploaded a video sharing that she has broken up with Nats. This angered many of Gigi's fans and was very sentimental about the breakup as Gigi broke into tears in the video while sharing her breakup. 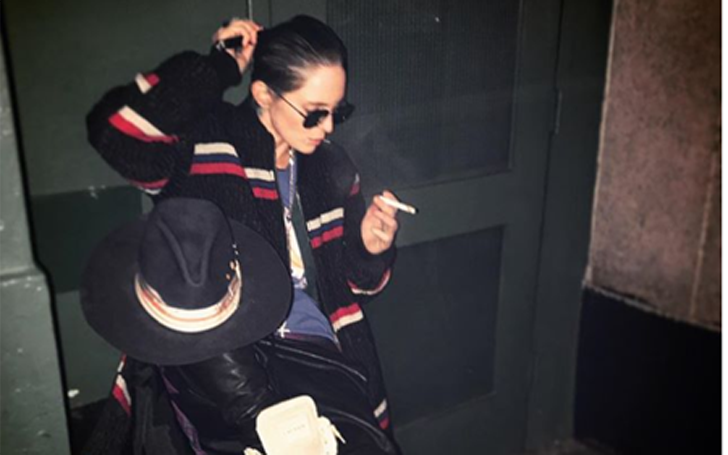 However, some fans were, even more, raged after she again announced that she had patched up with Nats through an Instagram post featuring the duo. After the rekindle, which took place at the end of 2016, their relationship has been going healthy, and Nats have made numerous appearance not only on Gigi's channel but also on her other socials. Nats herself has her Instagram filled with her girlfriend (her now fiance)'s pictures. Nats Getty proposes her beau in the grandest way possible. On 9th March 2018, Gigi announced that she and Natx got engaged to each other showing off her fiance and her giant ring. She made sure to upload each and every part of the proposal on her YouTube. The proposal was massive, involving a helicopter trip to the romantic city Paris, fireworks and a luxe French State. As Nats got on her knees to propose the love of her life, and Gigi saying yes, the surrounding witnessed hundreds of fireworks in the sky. Nats can also be spotted kissing and hugging Gigi after the proposal turns out exactly how she imagined. And also let's not forget the giant diamond ring she proposed with. In the video, they seem happier than ever, and fans who ship the two can expect a new video of their wedding very soon.